This is a continuation of our recent First Class trip to India, a journey where we had Big Travel with Small Money! The Flagship Lounge in Chicago was very close to our gate so we were soon walking down the jet bridge to get inside the plane. The flight attendants greeted us at the entrance to the plane and asked us to “turn left” as we entered the aircraft. This was our welcome to American Airline’s Flagship service from Chicago to London! We turned left and walked to our seats. We had chosen the middle 2 seats in the second row so that we could swivel our seats and have dinner together. Each First Class seat occupied the space of approximately 4 to 5 economy class seats, which helps explain why a First Class seat cost so much (even though not many folks pay that price). 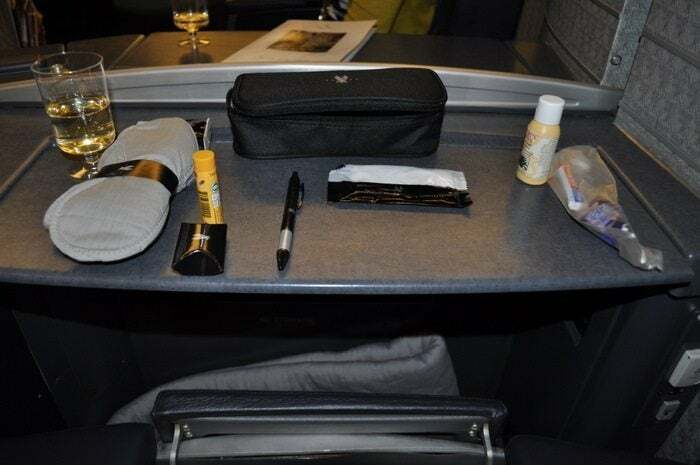 The cabin was clean and on the seats was a blanket, amenity kit, and a mattress pad. Slippers and pajamas were not provided like they were on our later flights with British Airways and Jet Airways. The airline which, years ago, removed the olives from salad, had now removed the slippers and pajamas! What’s next?! The seats looked a bit old, but that was likely because the aircraft was old too! We went to our seats and chatted with the couple behind us. 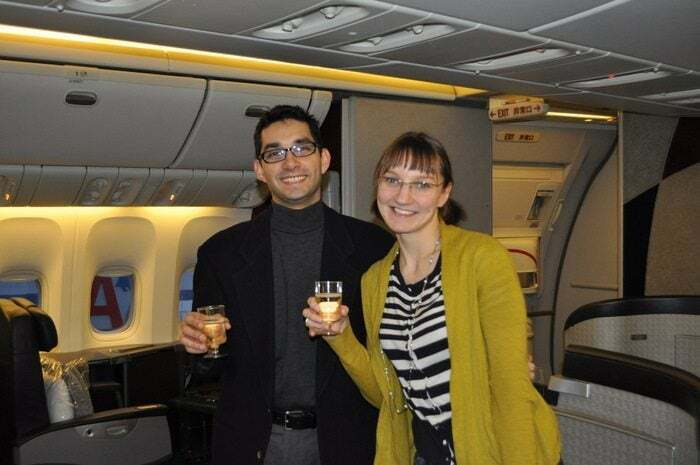 They, too, had redeemed miles for their flight from Chicago to Cape Town with a stop over in London! We were soon served Champagne. 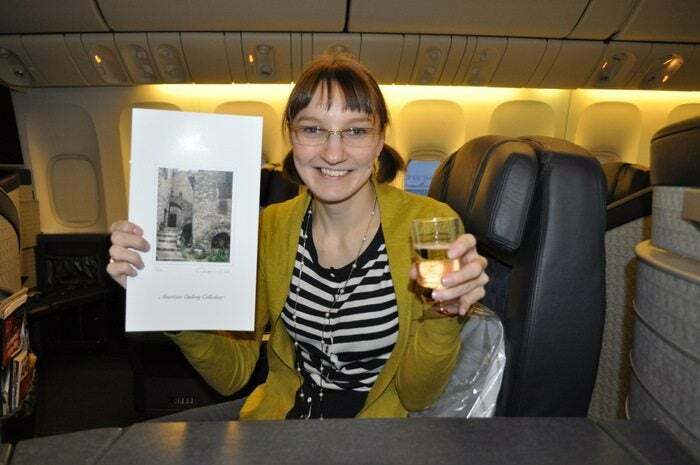 Unlike Emily’s trip back on Jet Airways, the Champagne wasn’t Dom Perignon and the bottle wasn’t left with us. But it was still Champagne! We chatted for a while over Champagne and then took a few pictures. 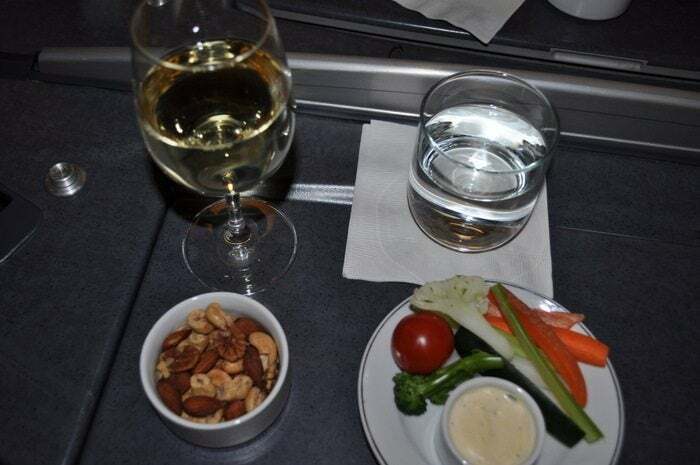 American Airlines Flagship First Class – Chicago to London – Another Pre-Departure Toast! Our flight was delayed for about 50 minutes, which meant that we would have less time to explore the lounges in London. Oh well, stuff happens. Fortunately, we had a 3 hour layover, so we wouldn’t miss our connecting flight. I took pictures of the amenity kit and reviewed the menu to pass some time. 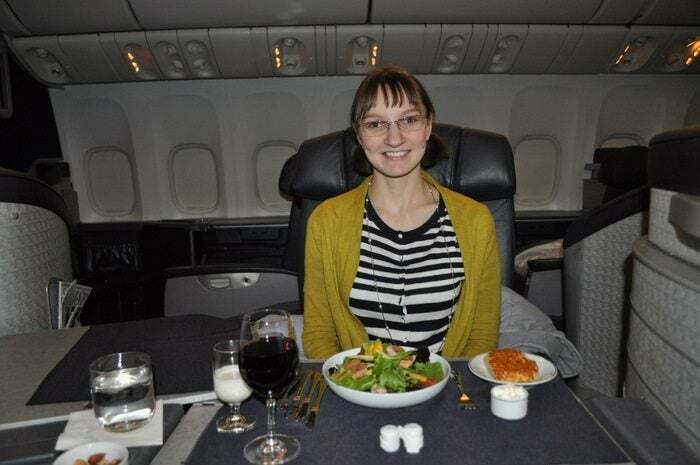 Now, the good thing about American Airline’s First Class is that the middle seats can swivel and face each other and that you can join the tables together to have a private dining experience. 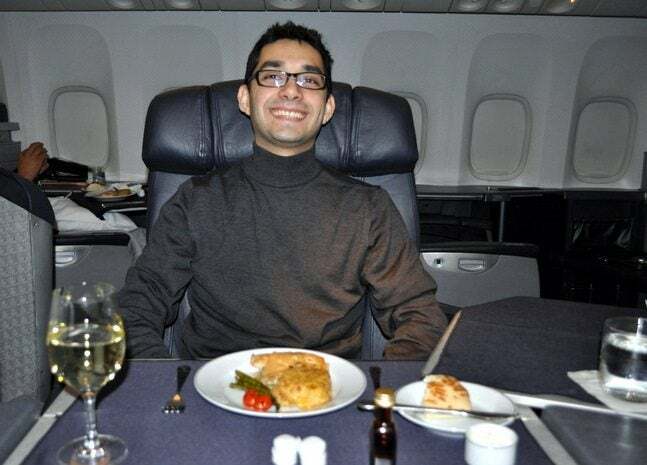 This is much more comfortable than in many other airlines where you have to sit on a little stool if you want to dine facing your travel partner. 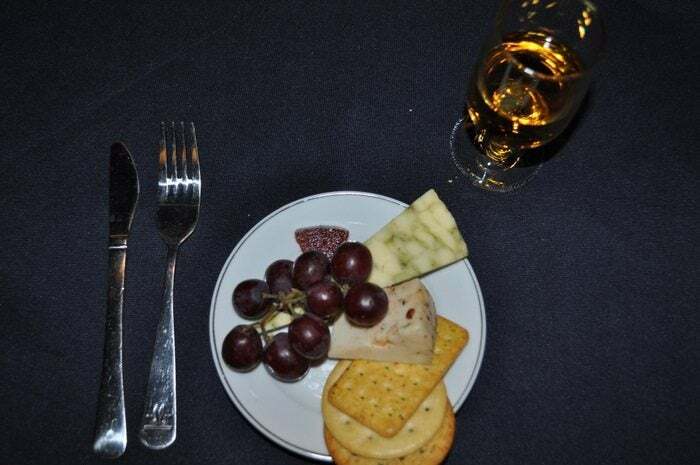 American Airlines Flagship First Class – Chicago to London – Dining Together! 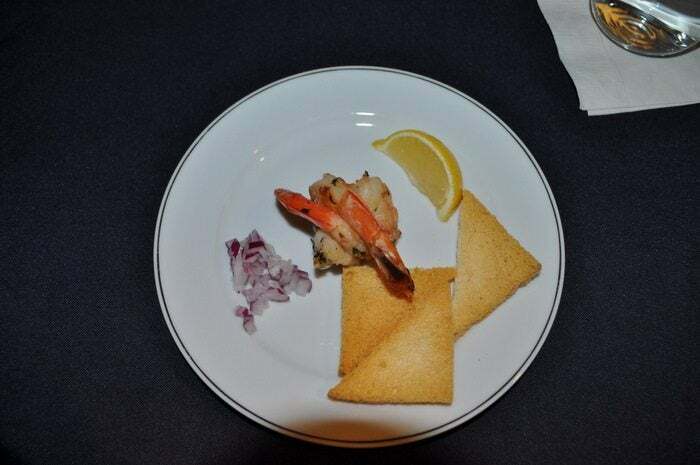 American Airlines Flagship – London to Chicago – Shrimp with onions and toast! The salad tasted like a regular house salad. I learned that “stir fried vegetables” = 5 asparagus stalks and 2 cherry tomatoes. I preferred Emily’s steak! Why is she always right?! 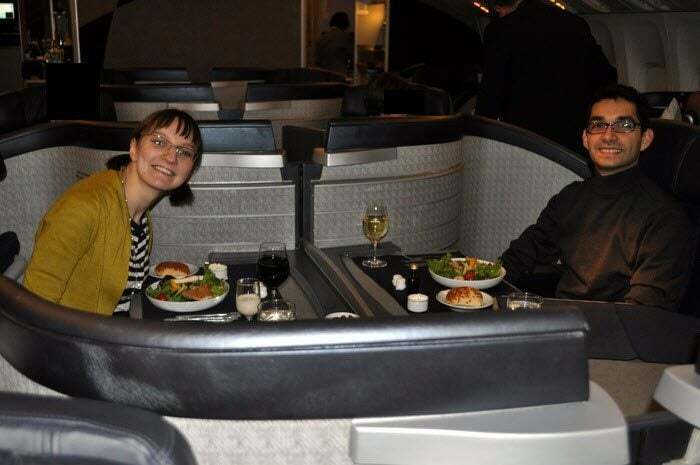 American Airlines Flagship First Class – London to Chicago – Waiting for Emily’s Steak! 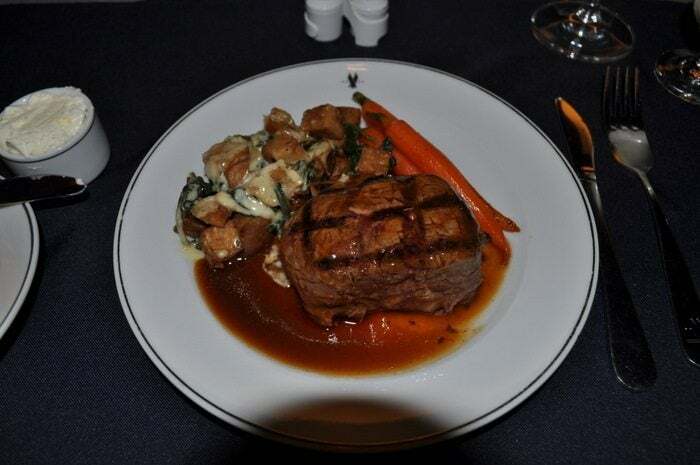 American Airlines Flagship First Class – London to Chicago – Emily’s Steak! 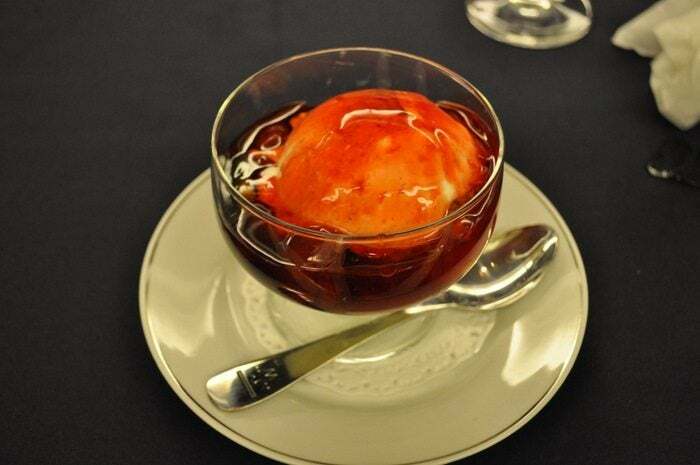 It tasted like any other Ice Cream Sundae. The description was accurate because there was exactly one piece of dried fruit. See if you can spot it in the picture! 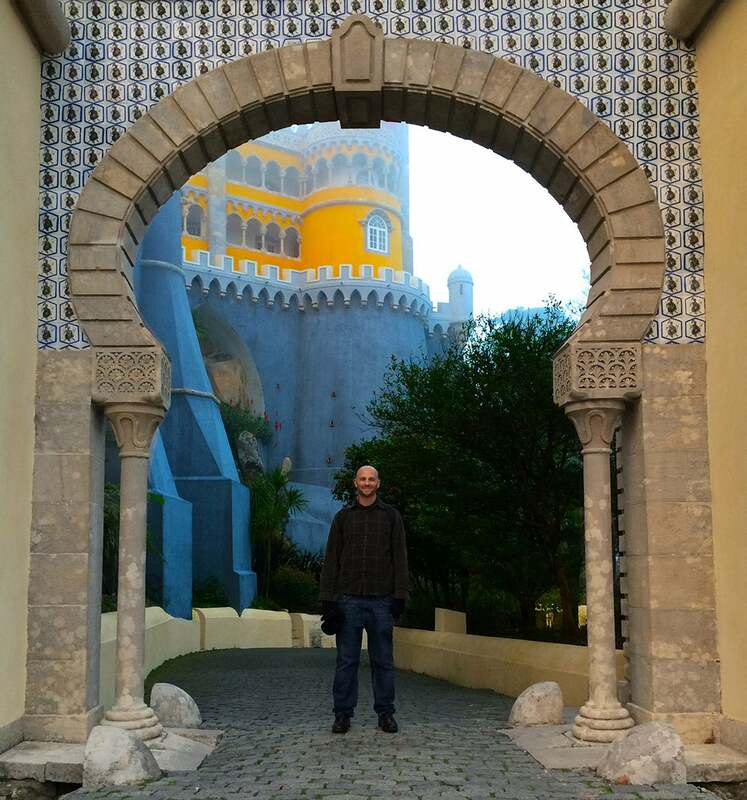 After the cheese and port wine, it was time to sleep (another of my favorite activities!). I helped myself to the mattress pad from the seat next to me since it was empty and placed it on my seat for some additional padding. 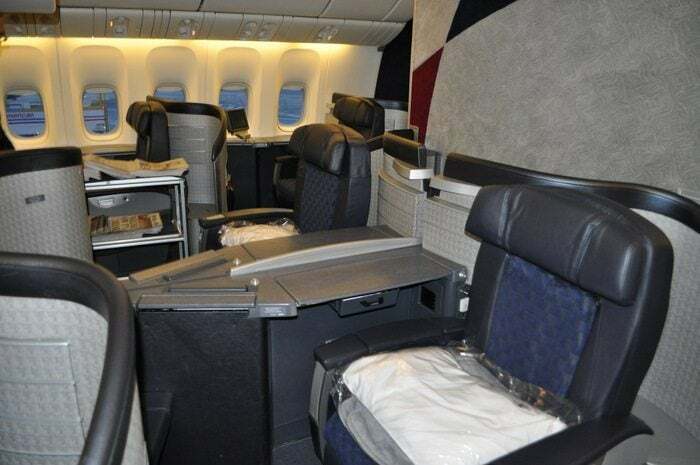 American Airlines Flagship First Class – London to Chicago – Sleeping Like A Baby! Soon I was fast asleep. We asked not to be awoken for breakfast, so I don’t have any pictures to share. Our flight landed smoothly at London Heathrow and after 15 minutes we were at our gate. We got off the plane and made our way to Terminal 5, but not before paying homage to the security gods (lowercase “g” intentional) who evidently had not seen an Epi-pen (Emily is very allergic to fish and needs to carry 2 Epi-pens with her). They performed all sorts of tests and measurements on said Epi-pen and wrote in secret diaries and conferred in whispered voices with colleagues. But soon we were free (the Epi-pens too!) and we headed to the Concorde Lounge! Bottom Line: It was nice to have a flat bed to sleep on for our journey to London – that’s Big Travel with Small Money! 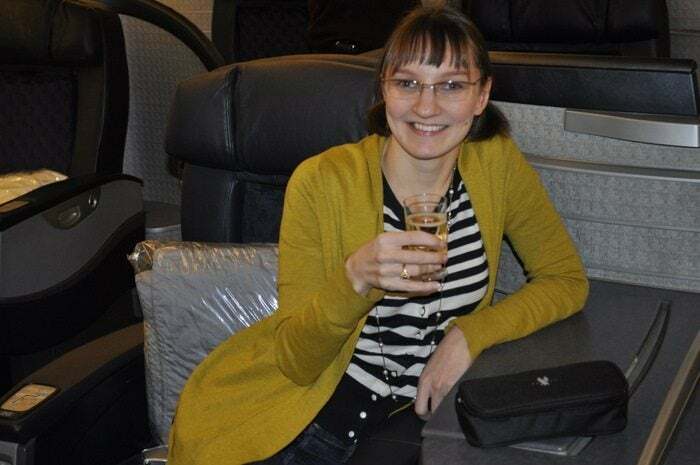 But the American Airlines First Class seats need some major upgrades, and the staff need to be a bit more attuned to their customer’s needs especially when you consider the retail price of a First Class seat from Chicago to London. 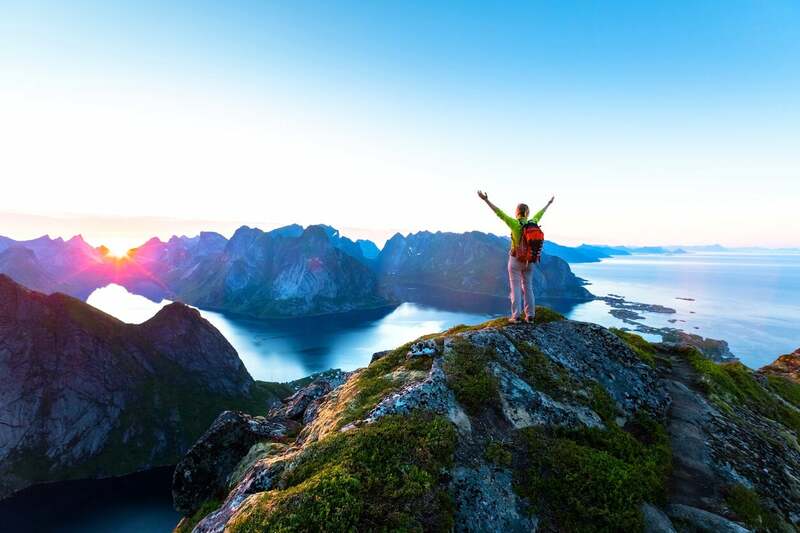 We got the impression that we were intruding upon the Flight Attendants time by eating our dinner slowly and weren’t made to feel as welcome as we would on our other flights. But, this flight was much better than Emily’s flight back on American Airlines where a garbage bag was hung in front of her seat and she was yelled at when she took a picture of the hanging garbage bag! 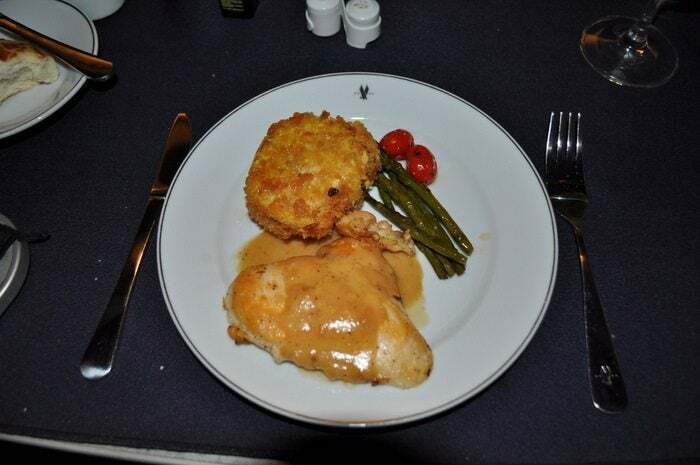 The food, beverages, and service were nice (say, 6.5 out of 10), but would pale in comparison to what we received on British Airways. Then again, you pay higher taxes and fees to redeem AA miles for travel on British Airways. Stay tuned for the installment where we experience British Airway’s First Class Concorde lounge in London Heathrow and get a 15 minute massage in the lounge! 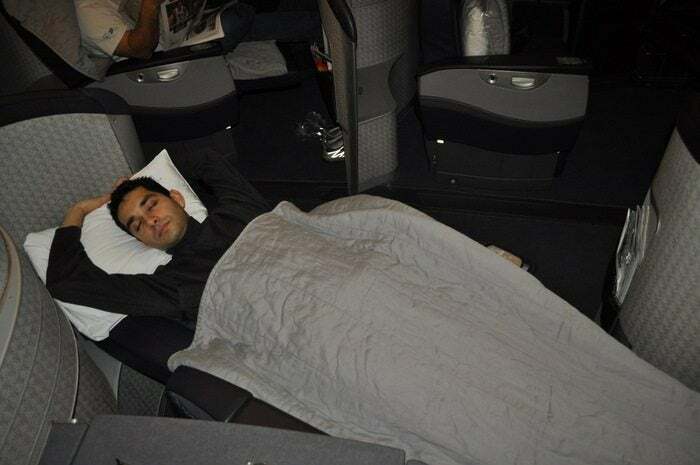 What do you like the best about First Class travel? The bed, the food, the service, or the space? Hi Daraius. Stumbled upon this while looking for photos of the first class flagship as there really aren’t that many on the web. My daughter and I are off to Shanghai on Friday and first class (or on Cathay it’s business class) middle seats are tough with young kids so was wondering how staggered the aisle and window seats are, because that’s usually the best bet. So, thanks for the pics… very helpful. @Grado – I’m 5 fee 9 inches and found it quite comfortable. Then again, I can sleep anywhere! Thanks for this report. We’ll be flying AA0170 NRT-LAX soon (booked with Avios) and I was disappointed this is a 777-200 since it’s our first time in first. Husband is 6’1″ and the beds look short. Will he be able to stretch out? Been twice on AA F to LHR will be returning this fall. 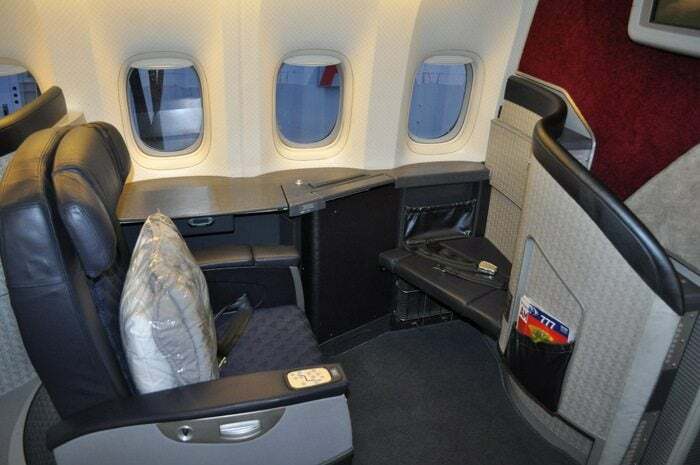 Choice of BA first on a 747-4 or AA 777, except as noted fees are $500 on AA for 2 & $1200 USD on BA. 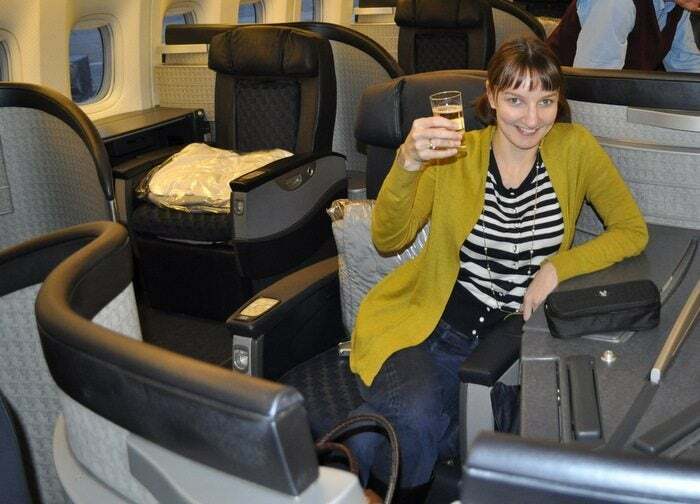 Always enjoyed the wine and seats on AA, but wanting to try BA. Actually never been on a 747. Anyone recommend one over the other, the money being a non-issue. Yes, they have announced new 777 arriving this fall, starting DFW to Buenos Aires, then DFW-LHR. They have started taking delivery of the new 73-8, nice domestic flight. Great Review! 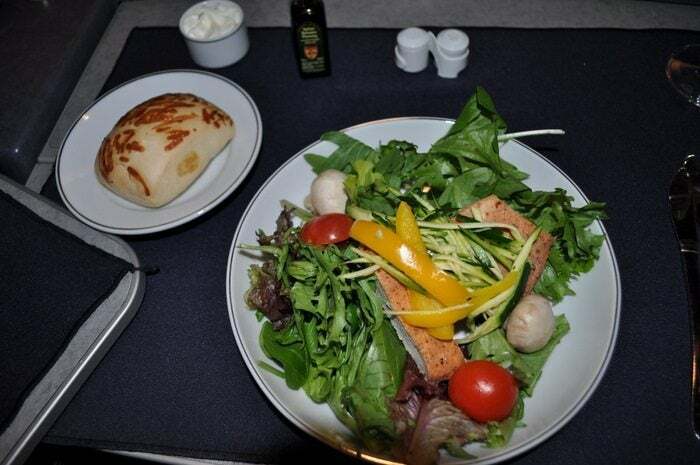 BTW the staff on one of my AA flights (I was in Business Class) told me that the food was basically the same in International F class as in business class, although F class has one additional entree. (at least o the 777).